Marilyn Waring helped pioneer the feminist critique of mainstream economics for ignoring the unpaid work that women do even though this is essential for sustaining economies. Her best-selling book If Women Counted: A New Feminist Economics (London: Palgrave Macmillan, 1989) explored what would have to change in economic statistics and economic policy to make what women do really count. For instance, time use studies would need to be conducted on a regular basis to reveal the time spent on unpaid as well as paid work. The measure of economic output of a country, the Gross Domestic Product, would need to be expanded to include the output of unpaid work. The impact of economic policies would need to be evaluated in terms of their impact on unpaid as well as paid work. This edited collection of essays shows how scholars, activists and students in many countries have been inspired by Waring’s work, and discusses how far the field she helped to create has evolved in the twenty-five years since her book was published. It includes discussions of advances in feminist economics (Bjornhølt and McKay; Aslaksen, Bragstad and As; O’Hara), and critical reflections on counting non-market processes (Aslaksen and Koren; Varjonen and Kirjavainen; Caspar and Simmons; Julich; Fairbairn-Dunlop; Dobell with Walsh; Katzav and Richter). There are also examinations of care and care-work (Shivdas and Mukherjee; Peters, Hemingway, Vaillancourt and Fiske) and policy-making and advocacy (Grace and Craig; Smith; Turnbell and Fridell), and personal reflections on teaching and being taught by Waring (Eichhorn; Webster). The contributors come from a varied range of academic backgrounds and countries. The editors, Margunn Bjornhølt and Ailsa McKay, have brought together a rich mix, with something to interest most readers of Feminist Review. Tragically, Ailsa McKay passed away as the book was being published. She will be remembered for her warmth and vigour and fearlessness in urging economists and politicians to change their analysis and policies to really make women count. 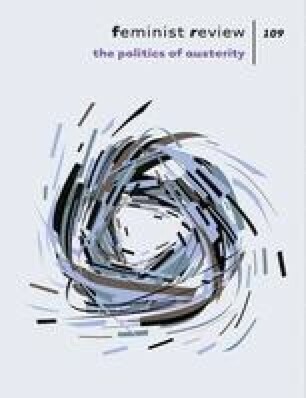 In the opening chapter of this book, McKay and her co-editor Bjornhølt highlight the gendered impact of the economic crisis in Europe in the years since 2008, drawing attention to the way that cuts to public expenditure transfer costs of care from the paid economy to the unpaid household economy. They also see this crisis as an opportunity to reshape economies and economics. In particular they call for a re-interpretation of public spending on care as an investment, and for rethinking the relationship between the economy and human beings. They identify three approaches that might help in doing this: recognition of the vulnerability of the human condition; evaluating economic policy in light of the human rights obligations of governments; and collective action to govern the use of common resources, such as land, water and climate. All three are rooted in rejection of a narrow ‘economic man’ understanding of human beings and embrace a richer understanding of people as social beings capable of understanding the value of what the market does not count. In the space of a short review it is not possible to engage in detail with all the contributions to the book, so I will highlight two chapters that are particularly relevant to the theme of counting women’s unpaid work. Julie Aslaksen and Charlotte Koren show, with examples from Norway, how unpaid household work can be made visible to economists through measurement in comparable terms to components of the Gross Domestic Product. This requires data from surveys of time use and a willingness to impute a money value to the hours spent on unpaid household work. Statistics from Norway estimate that the value of such work in 2010 was equivalent to 26 per cent of Norway’s GDP; the unpaid work done by women was equivalent to 14 per cent of GDP and by men 11 per cent of GDP. However, as shown in the chapter by Johanna Varjonen and Leena Kirjavainen, there is no guarantee that policy makers will take such estimates into account. They explain that Finland also has estimates of the monetary value of unpaid household production. In 2006 this was estimated by Varjonen and others as equivalent to 39 per cent of GDP. However, the official statistics for Finland did not incorporate such estimates and economists did not use them in their analysis and policy advice. Nor were academics in women’s studies interested in using the estimates. Varjonen and Kirjavainen speculate that ‘Perhaps estimating the monetary value for housework was regarded as a representation of the mainstream patriarchal economy because the macroeconomic concepts of production and methods were used’ (p. 82). Some feminists are particularly unhappy with the idea of imputing a money value to unpaid work, fearing that this distorts and devalues work that is not done for money, and in which love often plays a vital role. Some readers of Feminist Review may share that view—if so, I urge them to read this book, and see whether their view remains the same. I think it would have been useful if we had been able to mobilise statistics on unpaid work in examining the impact of austerity on women in Europe but this has not been possible because the surveys required to construct them—time use studies—are not conducted on a regular basis. It is a scandal that European governments can produce quarterly estimates of employment in paid work but not in unpaid work. Despite many valiant efforts, women do not as yet really count in the conduct of economic policy. This book is an imaginative contribution to an ongoing struggle.